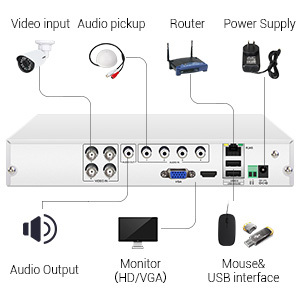 * What You Get:1 x 4CH 1080P AHD DVR,2 x 2.0MP CCTV camera,2 x 60ft Power Video Cable,1 x 1-4 splitter cable, 2 x 12V DC Power Supply,1 x Remote Control,1 x Mouse;welcome guide,our fan-favorite 12-month warranty and friendly customer service. * Build-in IR-cut filter, color on day, auto switch to B&W at night,clear day/night picture,waterproof Mental Material camera can be used in any climate conditions. 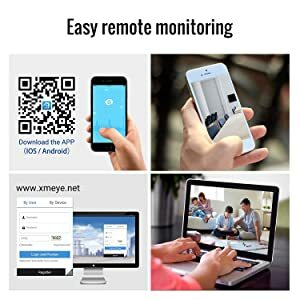 * High Speed long distance real-time transmission,Remote Live View and Recorded Video Playback via Windows Software,Remote Live Camera View a from iPhone, iPad and Android apps (included for free). * Email alarm with Text if Activity Detected, Support Motion Detection,Can Help you Save Hard Drive Storage Space without Missing any Important events. More Smart than You Can Imagine. 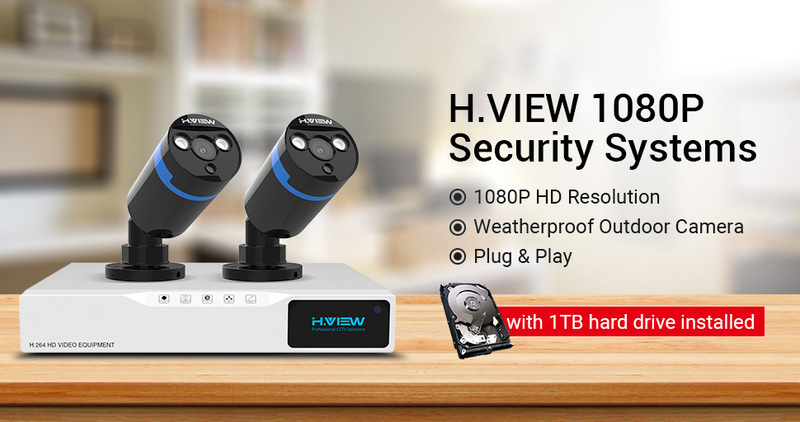 * Guaranteed for a full year from purchase with Lifetime Technical Support offered exclusively by H.VIEW via Email, making this quality professional HD security device suite one of the best values available for a video security system purchase. H.VIEW Provide most professional products to customers, we can ensure all products you received are most security product you have ever used. The Cameras are completely 1080P Security Cameras providesyou with High Definition 2.0 Megapixel Video. These cameras can be used indoor and outdoor, each camera with IP66 Wehatherproof design. The cameras comes with 6mm lens which is appropriate for most applications. Built-in 2 Array IR-Leds, See up to 30m in complete darkness with the built in Infrared LEDs. Each H.VIEW system is simple and easy to set up. It comes with a product manual, Which is extremely easy to follow, Finally, this system comes with sign and surveillance stickers to use where you wish as a deterrent for theft and intruders. If you are looking for top HD quality at an unbeatable price look no further than our H.VIEW Systems. 3 in 1 DVR recorder, can support 1080P/720P/960H camera, according customer's feedback to update sotware, user interface of dvr is designed to be intuitive and easy-to-use, 24 selectable languages and changebale video stardard design meet all needs of user. 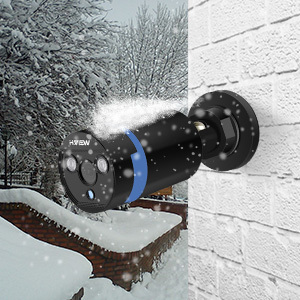 Record continuously, set a schedule or enable motion detection. With Recording 24/7 function you can playback all details system captured, Schedule recording can be more convenience for user to playback footages, Motion detection settings allow you to record only when motion is triggered in targeted areas. Built-in 2IR-Leds, 3.6mm lens, provide wider view angle, there is no need to adjust the camera to meet your view needs. These cameras have night vision up to 30M in complete darkness, whether awake or asleep you have peace of mind knowing you can rely on your H.View system. Whether indoor or outdoor, daytime or night, these cameras will provide you with clear surveillance video that you can count on. Images from Cameras are digitalized immediately with no conversion or image degradation due to distance traveled over a network. In addition, digital video images are easily stored and retrieved. In order to make it easier for using, we designed with adjustable ball design, when you want adjust the camera's angle, you only need whirl the ball rather than using an alan key up ladders, more safer, more inconvenience. Scan the QR-Code to download the H.View app and get easy remote control over the system wherever you are. you can monitor your home and business. The user interface of the app is designed to be intuitive and easy-to-use.Our technology Team will Update the software according the demand and feedback of customer, we devote to bring convenience and safe app to you. You can Add system to you tablet,Remote control system, set record with your tablet, enjoy 1080P image, we created groundbreaking and beautifully designed interfaces for remotely managing or viewing your HD system using common PC web browsers，PC client. H.View create a system which support Motion Detection, Can Help you Save Hard Drive Storage Space without Missing any Important events. 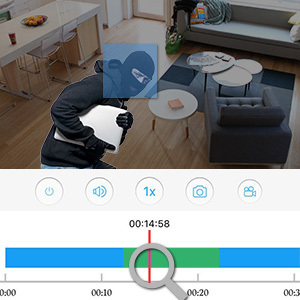 Use the DVR to customize motion detection exactly to your needs: set a perimeter zone, specify which areas of the camera's motion grid are active, and even set a 24x7 schedule for when the alert system is armed or disarmed. The motion sensor sensitivity can also be customized to prevent false alarms such as plants moving in a breeze. When a camera detects motion per your customized settings, it can activate multiple security responses including turning on the DVR's buzzer, sending an alert email, and triggering recording. H.View HD 1080p (2.0MP) IP66 bullet cameras feature with 2 high-intensity IR-LEDs for night vision with exceptional clarity at distances up to 30M. 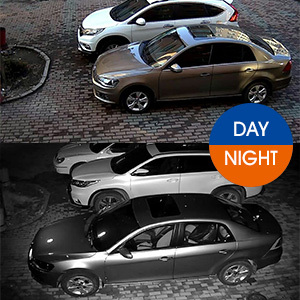 The cameras' infrared mode is automatically activated in low lighting conditions, and with this system's uncompressed signal transmission, which delivers real-time, highly reliable video security without loss or delay, any intruder unfortunate enough to cross paths with your HD system will have their every move illuminated and captured in detail. These cameras designed with 2.0MP resolution and 3.6mm you can see license plates, faces and cars in exceptional detail.